Peter Marks Ambient, Experimental Things are changing in this style of music, there can be no denying that many of these artists have begun a transformation in the world of dark ambient. A fuller range of instrumentation and additional layers of harmonics are being employed; Shrine have certainly given us an album which does not conform to the standard hallmarks of what we've heard over the years and are to be commended for this harrowing auditory exposition which glistens like kelp washed up upon the shore in the wake of an Earth shattering storm at sea. I first noticed this evolutionary process beginning on the most recent record which Vortex put out: greater emphasis on emotional manipulation which is brought to the forefront of the sound instead of the usual burying in back of massive, droning waves. Darkness is all very well and fine but it cannot endure forever, something must emerge from the velvety grip of dreamless sleep or one will become lost and never find their way to anything except more blank, drifting oblivion. You know how usually when you get work like this, the overpowering and almost suffocating feel of sorrow is omnipresent well with Somnia there's an actually hopeful upside to it. The emotions this release bring out are ones of trembling desire, I have many thoughts that flow back into her arms and it almost puts a smile on my face to be transported so thoroughly by what Shrine have done to a brighter land of quiet reflection where the individual is left alone to quietly collect their thoughts in an isolated but beautiful land. The mastery of your own fate, one single solitary mind upon a beach walking the burning white sands as slowly overhead those clouds roll across the sky and gusts of wind whip at the debris left upon the spit of land coughed up from the sea's intoxicating grasp. 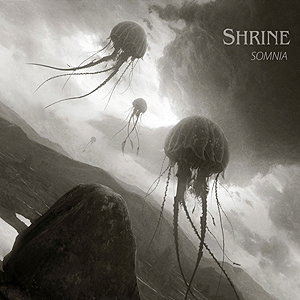 To come away from this album without having become one with it is not really possible, the intensity of what Shrine do is coupled with incredible skill at blending diverse and sometimes even hostile musical elements into a new hybrid of creative expression. People may only hear one continual tone but I'm blown away by the shifting, fractalized kaleidoscope of Hristo's universe. Many natural sounds are incorporated and played back throughout Shrine with additional dynamics brought out of their original versions through masterful manipulation of the frequency range; they are transformed into strangely intriguing accents of a dialogue which is conducted between what we can perceive and the actual language that Somnia are speaking to what only is visible when the lights go out and the mind begins to unravel it's tempestuous codex of fragmented logic. Each of us has their own set of rules and filters which determine how we process information and arrive at what our own definition of logic is, playing this release is a very direct way of accessing this cerebral control panel. Flashes of images come to me as I hear this, memories long subsumed by the years come back out like faded flowers in a collection given back their vibrancy and in the long forgotten, derelict corridors of remembrance between cells awareness flows again turning what was once withered into a living, breathing network of bliss. Things are changing in this style of music, there can be no denying that many of these artists have begun a transformation in the world of dark ambient. A fuller range of instrumentation and additional layers of harmonics are being employed; Shrine have certainly given us an album which does not conform to the standard hallmarks of what we've heard over the years and are to be commended for this harrowing auditory exposition which glistens like kelp washed up upon the shore in the wake of an Earth shattering storm at sea. I first noticed this evolutionary process beginning on the most recent record which Vortex put out: greater emphasis on emotional manipulation which is brought to the forefront of the sound instead of the usual burying in back of massive, droning waves. Darkness is all very well and fine but it cannot endure forever, something must emerge from the velvety grip of dreamless sleep or one will become lost and never find their way to anything except more blank, drifting oblivion. Each day I walk to work and look at the city skyline and in that pre-dawn palette of greys I sometimes have occasion to look down at my empty hand and I sigh gloomily at how this place now and then comes to rest of me like a two ton weight; then I remember when someone held it and then wrapped around me like a second skin, luminous and transcendent of all the tricks my despairing mind can play and the flicker of a smile plays across my lips. I go on and get through the day knowing that somewhere someone else is a part of me and they always will be. Somnia is the transference of all this scenery into auditory form. The warmth which washes through your veins, the swollen heart that rises up to almost choke you. The skin against your own late at night when the rest of the world sleeps in resignation but you're awash in a maelstrom of pleasure. Hold onto this moment, you can't let go. You mustn't ever let go.